We, the WOMEX organisers share the concerns of many regarding the refugee crisis in the Middle East and Europe. Western societies need to overcome the fears and the selfishness. This is a basic humanitarian principle we believe to share with our entire community. The world music community has always been committed to the issue of refugees, as migration has contributed to the development of musical diversity around the world. In the light of WOMEX being in Budapest this year, the recent debate on how to welcome refugees coming to Europe has also raised concerns to WOMEX delegates and reporting media. WOMEX has released an international press statement in the name of the organisers as well as the entire community. We heavily disagree with state actions at the Hungarian and other European state's borders and beyond. It is not necessary that people in need suffer or even die at borders and we condemn all violence against refugees as well as actions that prolong this suffering. We call upon the Hungarian government the European Union and and all its member states to prevent such mistreatment of people and to take actions to welcome them and help them. We offer our cross-cultural projects as another view to encourage welcoming more refugees and let foreign cultures into your lives as an enriching element - the notion that foreign cultures or regligions are a threat is the wrong way! "We clearly stand up against all forms of xenophobia, and this is only the least we can do. More importantly, it is our aim to set positive examples and stimulate mutual cross-cultural understanding through concrete, targeted and grassroots action. WOMEX impacts the city and the region where the event takes place as well as a global community through our international conference and public concerts to be held in Budapest and reported on all over the world. This year's artists, who come from 50 countries, demonstrate how essential diversity is: it is a building block of harmony. We feel signals like this are needed more than ever before." "Amidst the turbulence and concerns of the past weeks, unprecendented numbers of Hungarian and international volunteers have showed their solidarity to refugees. Some of these efforts are triggered by musicians of various genres who came together to mobilise their fans, organised aid chains and were personally present in the crisis zones. We have witnessed several moving moments that show how music can change mindsets, build trust and organise actual help. One of those moments has been the pop-up concert of Bea Palya. The singer, who will be on stage at the WOMEX 15 Opening, played for and with refugees in a transit zone. Look at the pictures that show the capacity of music to build bridges in an instant. It’s our responsibility to use this capacity whenever it’s needed." Culture, art and music are our the most powerful means, but looking at the suffering along refugees’ routes (as well as in other parts of the world) more immediate action is also needed. This responsibility especially lies with those who have the power and the means to help. However, we think everybody needs to contribute to end and prevent further suffering of our fellow human sisters and brothers. *as well as by supporting individual migrant aid initiatives in our office’s home in Berlin, in London as well as in our host city Budapest. *by sharing the opportunities to help as well as organising a possibility to donate on site at WOMEX as well as online. A special counter will be set up on site at the daytime venue Balna in Budapest. * As we believe in printed communication we will have ready special postcards for all delegates. They will contain parts of the above statement and leave room for the delegates’ and the public individual additions – with the joint aim be sent to the local authorities altogether (with the help of WOMEX). * WOMEX offers its reach and communications channels for further initiatives, petitions and more - and we encourage our delegates to take such actions! Watch out for the counter and the delegates bag for further info! We – the organisers - and many delegates we talk to aim to strengthen the role of culture in this debate and see their work in an even broader context than the refugee debate suggests. 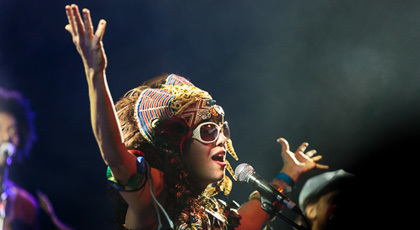 The world music community is able to - and needs to - contribute to cross-cultural understanding. We hope, and in fact we are sure about it, that you are in it with us, by hosting, participating in and promoting the WOMEX community and spreading its values through art. It is our – the organisers – opinion that the music and cultural work is our strongest means – by holding WOMEX in different countries in Europe – even in countries whose state’s government’s actions we condemn, we can change something for the better. First of all by our reach throughout the community of world music professionals. But also, more locally, by setting positive examples in our host city and strengthen the local community of a scene which is pro diversity – public audience as well as professionals. *The Professional Excellence Award, which this year will honour Ramin Sadighi of Hermes Records, who has played a key role in building Iran's music scene. *Several showcases also come to mind, but since it is our policy not to highlight showcases over others and since you can argue that each of them is equally relevant in setting an example pro diversity, you can browse those yourself and make up your own mind.